Valentines Day is tomorrow, and whether you have special plans or not for the evening we have a recipe that is perfect for anyone staying in that night. 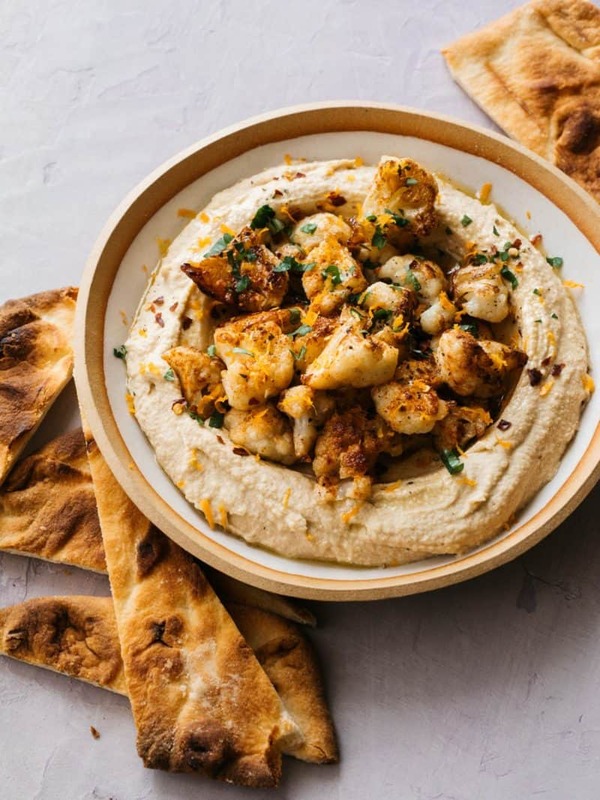 Our Spicy Roasted Cauliflower over Hummus is super simple to make and totally satisfying. My husband and I are huge stay-in on Valentines Day people. We’ve been together for about 14 years and we’ve stayed in on Valentine’s Day for probably the last 12 or so years, lol. I don’t think there’s anything wrong with going out for a special meal that night, but I’ve never been a pre-fixe type of gal and I’ll choose sweatpants and slippers over a nice outfit almost always. We also like to keep Valentine’s Day super simple in general. We used to cook these elaborate meals together, but now we just cook whatever we want and tend to keep things pretty basic (but still delicious). As long as we’re in the kitchen, sipping on some delicious wine or beer and cooking together, we’re happy. There can be so much pressure surrounding this sweet, but totally Hallmark holiday and we’re just over it. 2. Place cauliflower florets into a mixing bowl and toss together with oil, smoked paprika, cumin, coriander, pepper flakes, garlic, lemon juice, salt, and pepper. 3. Transfer cauliflower onto a baking sheet and spread evenly in a single layer. Roast cauliflower for 25 to 30 minutes or until nicely caramelized and tender. Remove from oven and slightly cool. 4. For hummus: Place garbanzo beans, plus reserved liquid, tahini, oil, garlic, lemon juice, and salt into the well of a blender and puree until desired consistency is achieved (adding water 1 to 2 tablespoons at a time, as needed). Adjust seasonings. 5. To assemble: Pour hummus into a large bowl and make a well in the center (can easily do this with the back of a ladle). 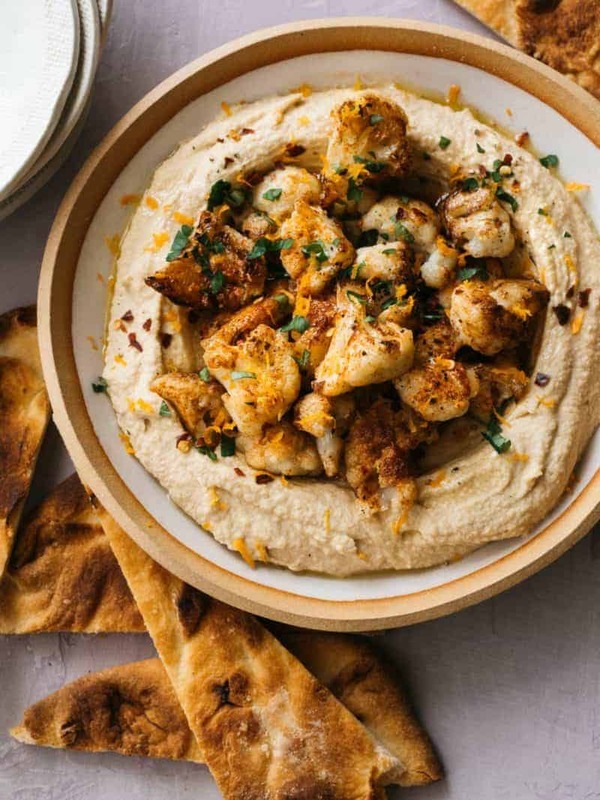 Fill hummus well with roasted cauliflower and top with more crushed red pepper flakes, lemon zest, parsley, and mint. Serve with grilled pita bread.